What else is there really to do in those first few weeks of school? This was our first full week of school and it was a FULL week. I don't know about you, but we have so much testing that needs to be done in the beginning of the year and most of it is 1 on 1. It's so hard in those first weeks to pull students one at a time and expect the rest of the class to work relatively quietly for an extended amount of time. It just doesn't happen! And truthfully, it is unfair to expect that 1st graders just coming off of summer CAN do that. It makes me feel awful to spend so much time at my teacher table testing and not enough time helping them learn our routines. For them it's probably like being thrown into a cold pool with all of your clothes on. There's no time to get used to the water or to even get prepared with the correct attire. It's just sink or swim! Ugh - I just hate that teaching is going in this direction, but I won't spend my whole post complaining. I will try to at least show you some of the things we did this week when I wasn't testing. I have to say that I am so proud of my little "swimmers". I have a GREAT class!!! First up is Daily Math. Each morning students get some practice with number sense, calendar, and even handwriting. The daily practice is SO important for these little guys to improve number sense. Once we get to the number 10, the Number of the Day pages change and include different concepts. I am already seeing a huge improvement in their number sense. 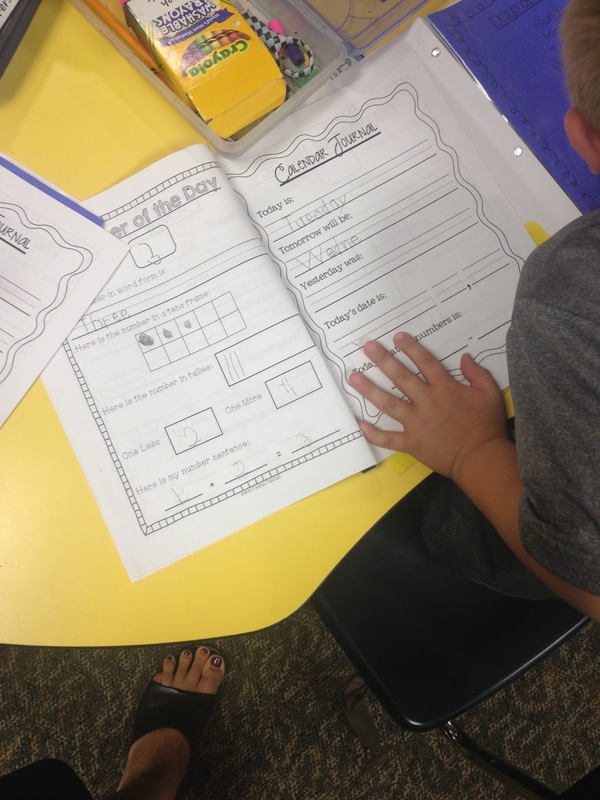 Click HERE to read a post about our Daily Math Folders. We also started doing some centers this week. One center that will be consistent each week is our writing center. Students have a writing journal and there are monthly task cards at the center to choose from. This first week we all used the same writing prompt to learn about this center, but eventually they will have the choice of topic. I can already see what my first mini-lessons need to be: What is a sentence? Why do need spaces between words? What's a word??? =) I joke....well, a little! They do need a lot of work with their writing. I'm up for the challenge. 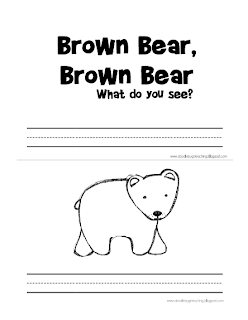 This week I was thrilled to find so many AWESOME freebies to use with the book Brown Bear, Brown Bear, What Do You See? 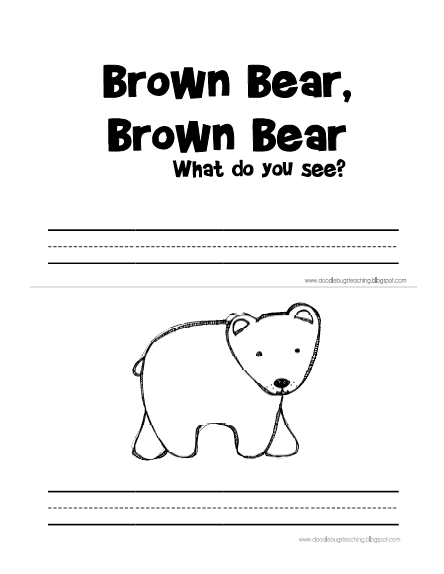 These were the perfect first centers for students to work through and review colors. I am also lucky enough to have a class set of these books so they all practiced reading this many times this week and get to keep this book in their book box. 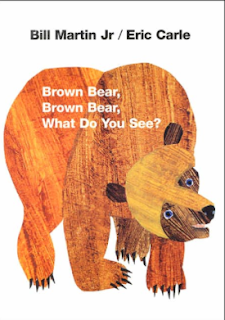 This one isn't for Brown Bear, but is a good review of color words. Another important routine is our morning meeting. For the first month of school we focus on student names during our morning meeting. We do one student's name each day. 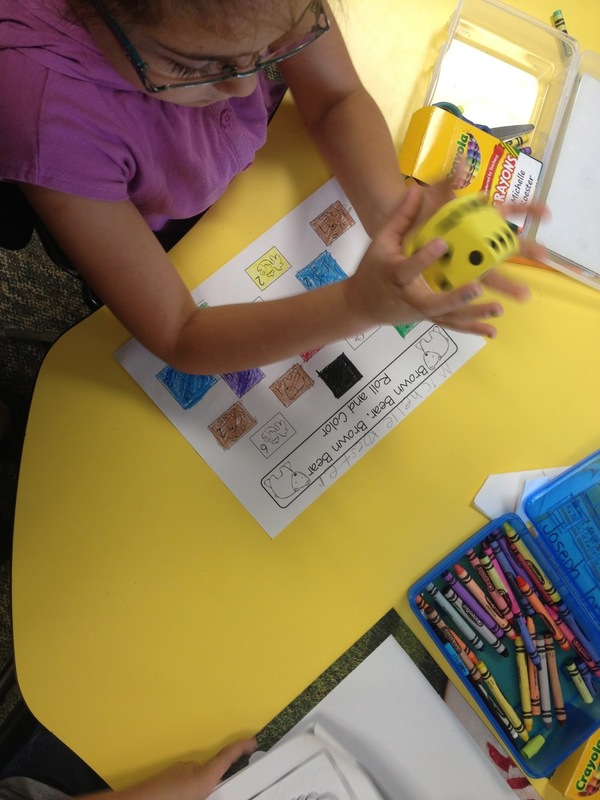 First the students found how many letters are in their names and used these colored squares to write each letter on and then glue onto construction paper. 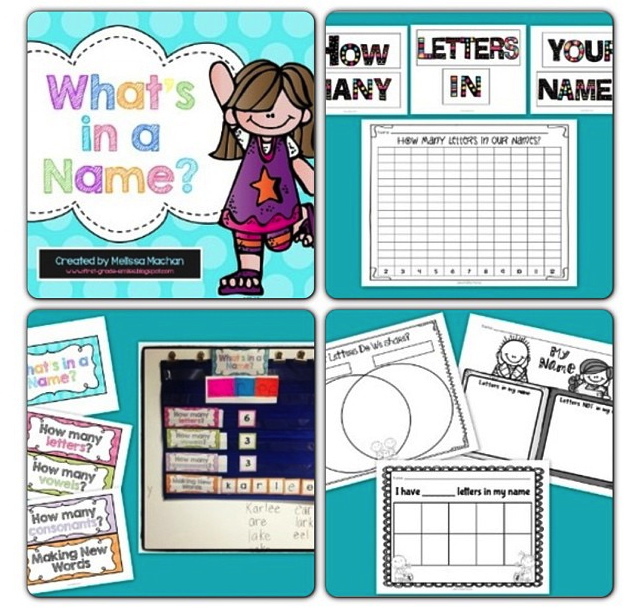 Then each day we will use one student's name and count the number of letters, number of vowels, and number of consonants. 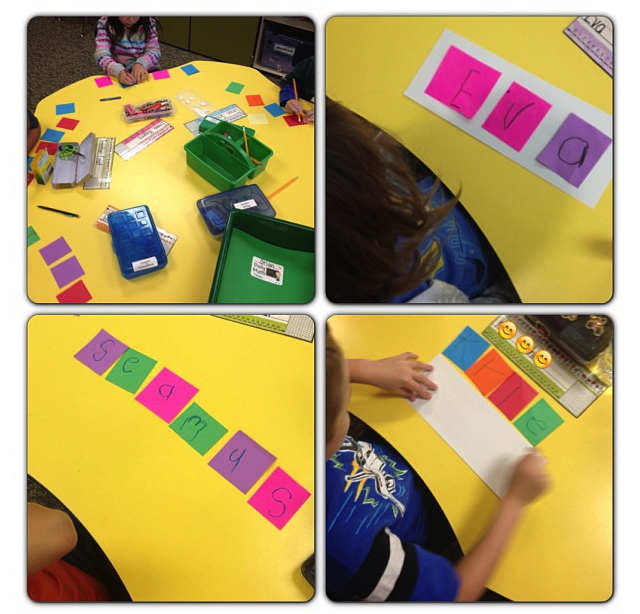 Then we will use the letters in their names to make new words. The kids LOVE being the focus of our morning meeting and seeing what other words they can make with the letters in their names. There was some interest in this idea so I just uploaded this on TpT with a few other ideas in it as well. I still have more tests to give next week and then I am excited to just start teaching! Do you have lots of tests in the beginning of the year too? How do you manage your class while you test? 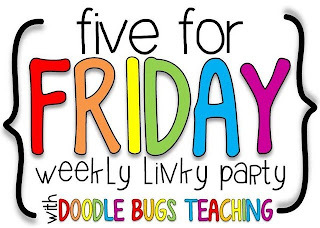 I linked up with Doodle Bugs for their Five for Friday linky with this post. I know I had more than 5 things, so I hope it's still ok. Be sure to click on the link and go check out this linky. 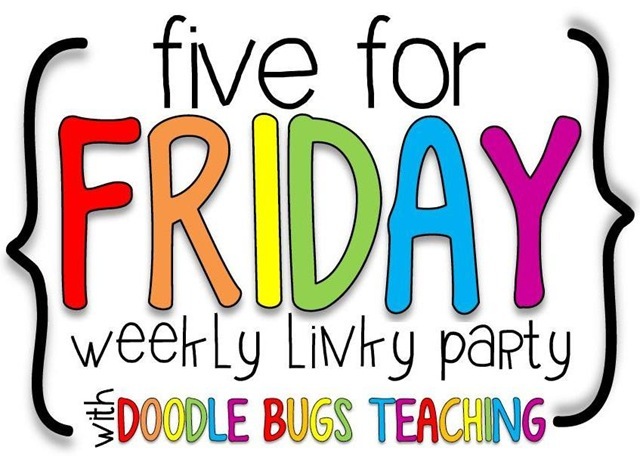 Doodle Bugs is amazing! You are so right about the routines! I love all the photos you took.... so far I'm just not finding the time. I have so much testing at the beginning of the school year! I gave them independent, review work and emphasized that I would be giving out A LOT of Table Points and students would be able to move their clips up during this time!!! I had to test in small little chunks throughout the day! It was hard!!! So, I completely understand! Love all of your activities that you shared!! I am your newest follower!